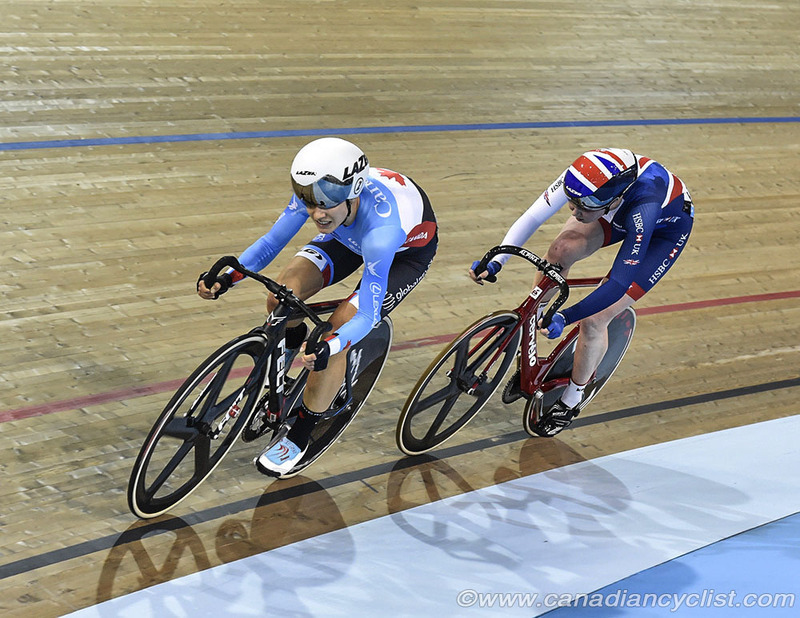 Team Canada had a strong start to the third round of the Tissot UCI Track World Cup on Friday, in Milton, Ontario, with Jasmin Duehring winning a silver medal in the women's Points Race. 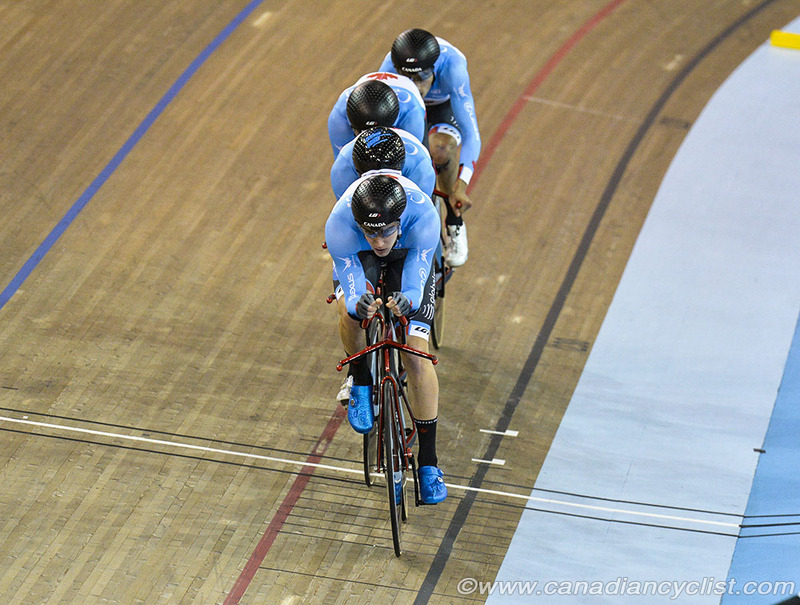 The third round of the 2017-2018 series is the only North American stop, and is the first Track World Cup to take place in Canada since 1998. 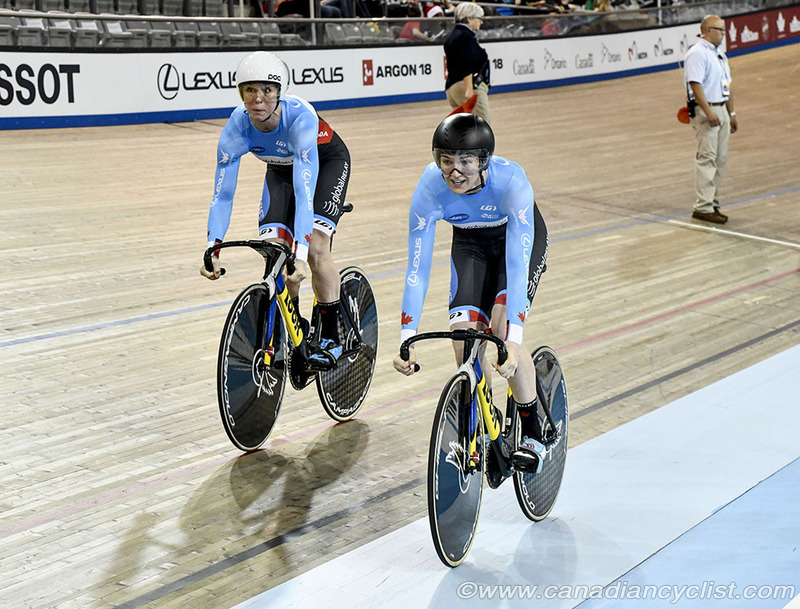 Duehring, who has taken some time off from racing this year while completing her degree in mathematics, scored points in five out of eight intermediate sprints, plus was one of four riders to take a lap on the field. The two-time Olympic bronze medalist finished with 38 points, nine behind winner Katie Archibald of Great Britain. Archibald won the first four intermediate sprints to establish a strong lead that she would never relinquish. At the halfway mark, Archibald, Canadian favourite Duehring, Jarmila Machacova (Czech Republic) and Coralie Demay (France) took a lap on the field to gain 20 points, and the race was down to those four. Duehring took a couple of sprints late in the race to lock up the silver medal, while Machacova held off Demay for bronze. "It's the first ever World Cup for me in Canada, and it's amazing to start things off with a medal," said Duehring. "It's amazing to see all the other countries here, and I feel so much pride in welcoming them to our facility, and racing in front of a home crowd. I had to adjust my tactics on the fly; I've been taking a break from racing and training while finishing my degree, so I had a few less cards to play out there. I think I raced strategically pretty well but, unfortunately, wasn't able to really give Katie a run for the gold medal." 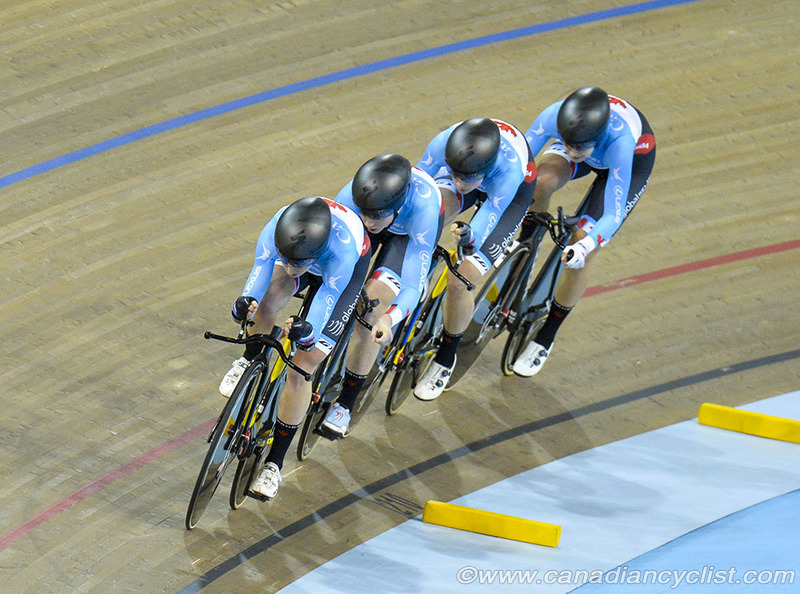 In other competitions, qualifying was held for the women's and men's team events; the Team Pursuit and Team Sprint. Canada and New Zealand dominated the Team Pursuits, with Canada winning the women's and finishing second in the men's, while New Zealand won the men's and finished second in the women. Both Canadian teams will move on to the next round, where they will attempt to qualify for the medal finals, with wins in the next round guaranteeing a ride in the gold medal round. The Canadian women will race Japan in the next round, after finishing 19 seconds ahead of them in qualifying, while the men will race the United States, who they beat by nearly five seconds in qualifying. For the Canadian men, it was a personal best on the Milton track by over a second. "The ride was quite positive," said Craig Griffin, Women's Endurance Coach. "It was a good effort and was the time we were hoping for [4:22.310]. We can always improve on a few things technically, but the girls delivered really well, and are a couple of seconds quicker than we rode in Poland [Round 1] with the same lineup a month ago. It's nice to race in front of the home crowd, and I'm sure that motivated the girls. I'm sure we'll just get faster." The Canadian women's Team Sprint squad of Amelia Walsh and Tegan Cochrane did not fare as well, finishing 12th in qualifying and not advancing to the next round. The pair were called for a false start on their first attempt, although the circumstances were a bit confusing - Cochrane did rock forward across the line 1.2 seconds before the start, but was back behind the line at the start time. However, officials ruled it a false start and the pair had to restart. The German sprint team anchored by Kristina Vogel were far and away to top Team Sprint squad for the women, while world champions New Zealand won the men's competition. The men's Points Race started out much tighter, with seven riders dropping the rest of the field. Niklas Larsen (Denmark), Mark Stewart (Great Britain) and Kenny de Ketele (Belgium) swapped the lead until Larsen took a solo lap on the field to score 20 points and lock up the win. Stewart held off de Ketele by four points to take the silver.